It is no secret to my nearest and dearest that I LOVE LOVE LOVE Valentines Day. Its a holiday that so many people love to hate, but I for one am totally drinking the Valentines Day punch. Give me red, pink, and anything heart shaped. I do get why so many hate the holiday, the romantic pressure is high and in my single years it really highlighted my loneliness. Plus Valentines Day can be expensive. I hate to say it, but If these are the reasons you hate Valentines Day, then you are doing it wrong! This is a day that you should focus on showing love and there are way better ways to show someone love than with $$$$. Write a love letter, give the gift of your time and service, or wake up a little early and make them a warm bowl of delicious oatmeal. With this in mind I decided to make an Oatmeal perfect for Lovers. Its beautiful, sophisticated, and easy, everything you want in a Lover…I mean oatmeal. 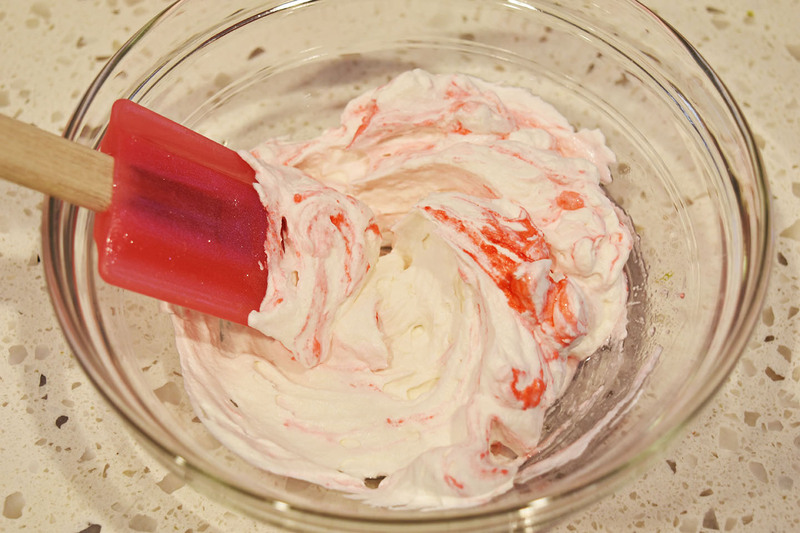 For the rosewater whipped cream I added a little rosewater extract and a drop of neon pink coloring, which makes this dish almost too pretty to eat. 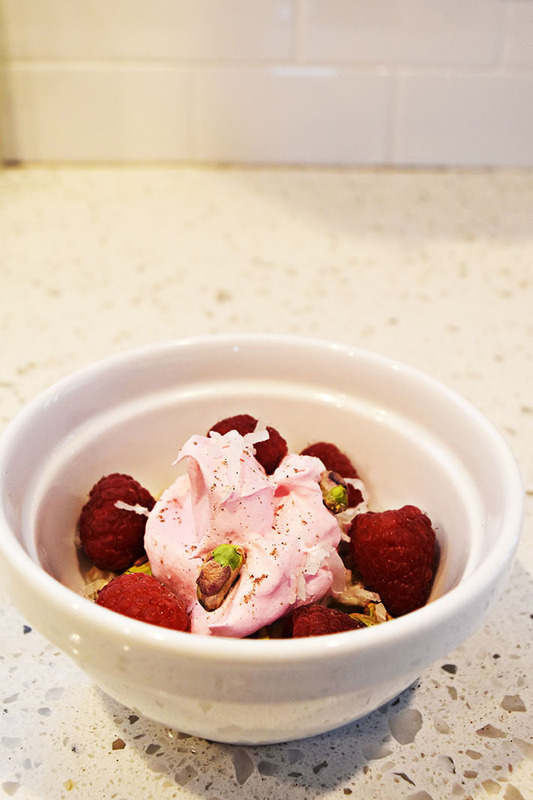 The pistachios are a great contrast to fresh raspberries. This oatmeal recipe has a great balance of salty and sweet, perfect for all the lovers and haters out there. I hope you enjoy. 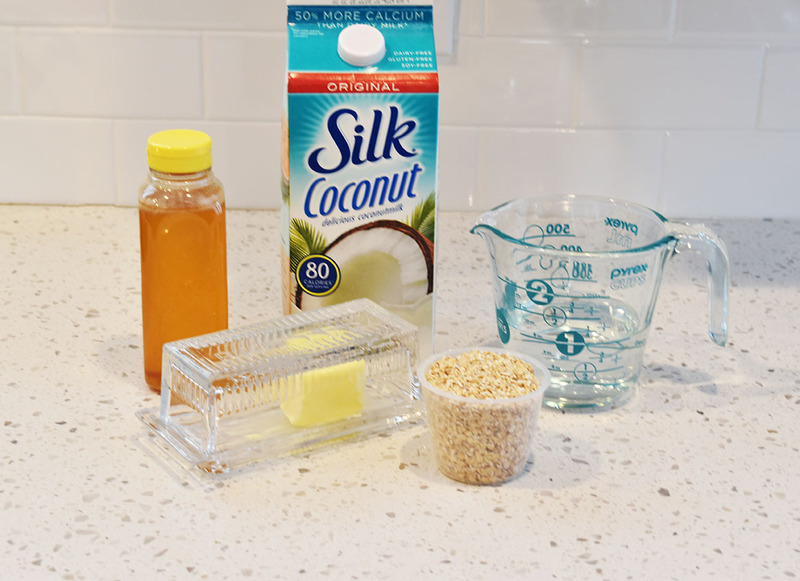 Add steel cut oats, water, and coconut milk to rice cooker, set to “brown rice” and let it do its magic. Be sure to check your rice cooker for specific directions on cooking oatmeal. My cooker takes about 20 minutes. Once the rice cooker is finished, stir in butter, honey, and shredded coconut until mixed well. 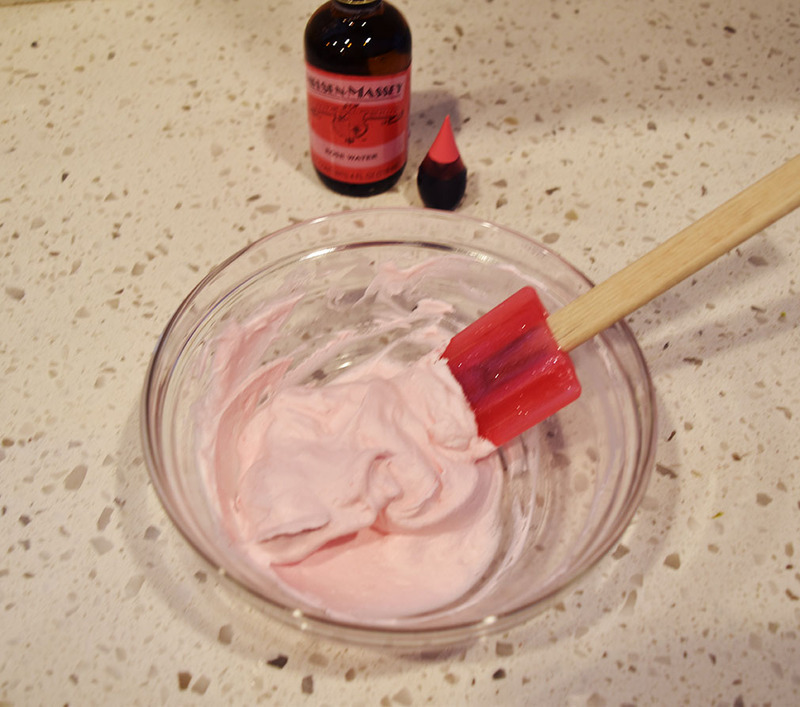 In a small bowl, combine Truwhip, rosewater, and coloring. 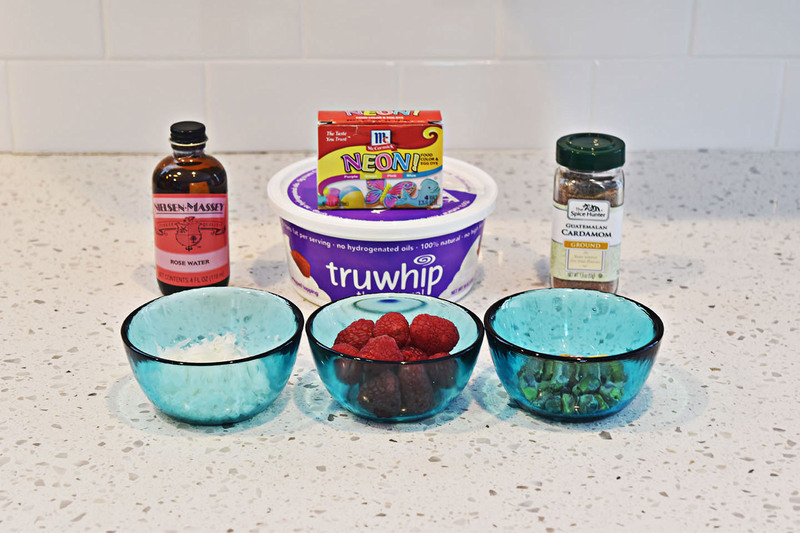 Spoon a large dollop onto a bowl of prepared oats. 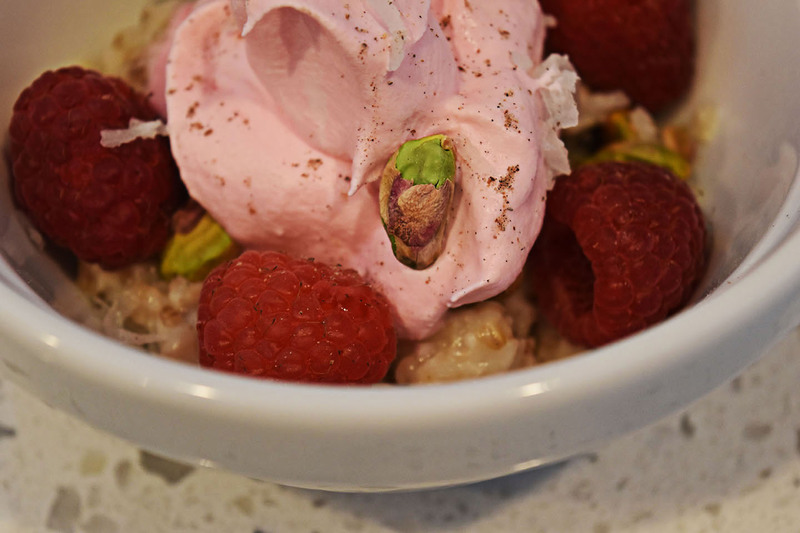 sprinkle with a pinch of cardamom, Raspberries, pistachios, and reserved shredded coconut. 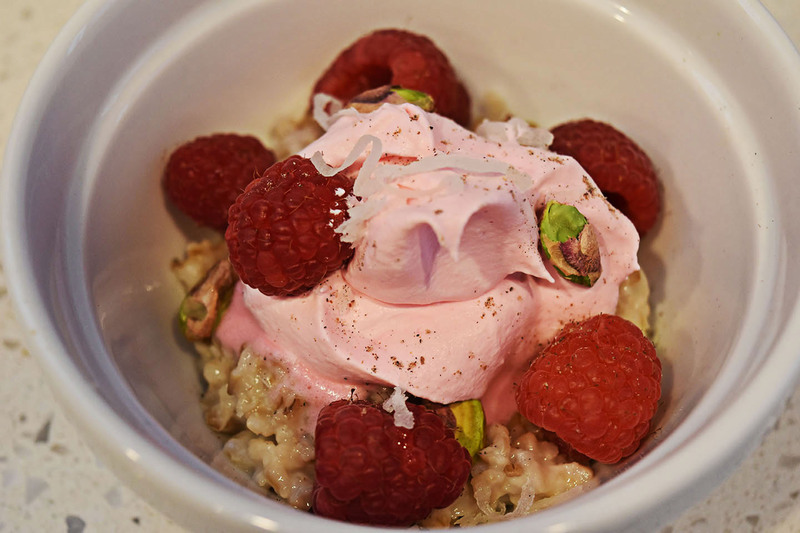 This entry was posted in Float My Oats, Sweet, Wanna Be Foodie and tagged cardamom, coconut, gluten free, living darling, oatmeal, pistachio, rice cooker oatmeal, rosewater, Steel Cut Oats, valentines day breakfast on January 18, 2016 by Sarah. I recently had group of darling friends over for brunch and mimosas. I decided to experiment on them with savory oatmeal. Unanimously they were skeptical. But luckily I have awesome friends and they gave it a try. The smell of bacon wafting through the house definitely didn’t hurt. I am thrilled to report that it was a huge hit. There is something so satisfying about this recipe. I chose two kinds of cheese, a really creamy Gouda and a Sharp Gouda, mostly because both tasted so good at the store, I couldn’t pick between the two. Definitely hit the cheese counter for this recipe. Add bouillon paste to warm water and stir until dissolved. 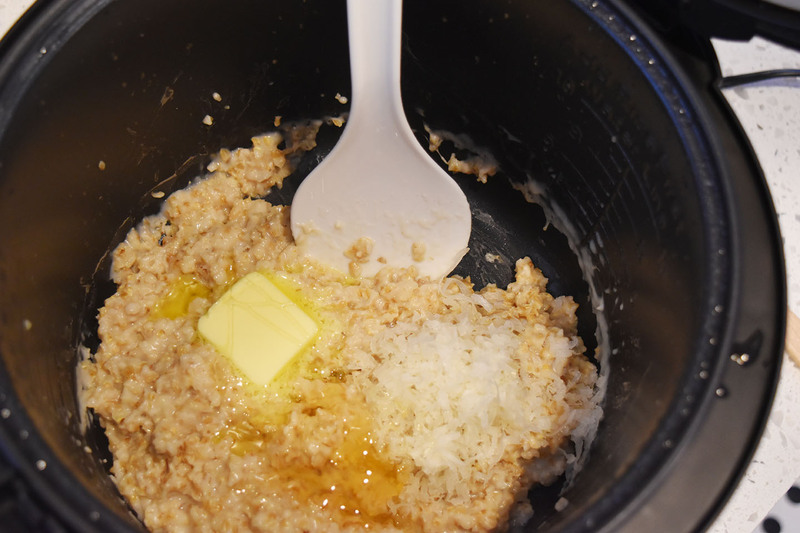 Add steel cut oats and water to rice cooker, set to “brown rice” and let it do its magic. For this large of batch it took approximatley 40 minutes. Be sure to check your rice cooker for specific directions on cooking oatmeal. Chop bacon into small pieces and cook until crisp. Place on paper towel and set aside. Remove grease from pan. Then add 1 Tablespoon of the butter and garlic to pan cook on medium high heat for 1 minute then add mushrooms, rosemary, and thyme. Sauté mushrooms for 4-5 minutes or until tender remove from heat and set aside. Grate cheese. Once rice cooker is finished, add remaining butter, grated cheese, and the mushrooms stir until combined. Place a heaping mound of Oatmeal in dish, top Oatmeal with a drizzle of olive oil, a crack of salt and pepper to taste, and sprinkle bacon crumbles on top. I really hope you enjoys this recipe and that it changes the way you view oatmeal. 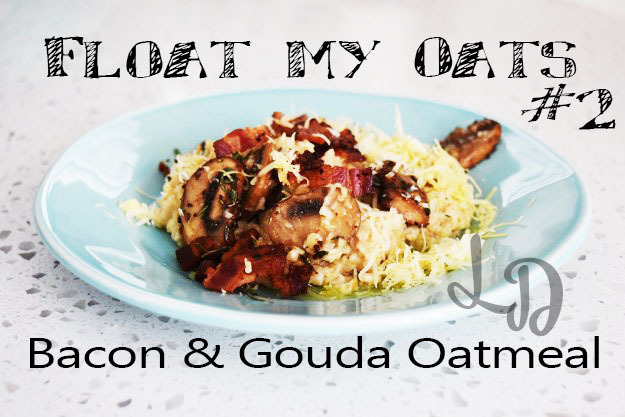 This entry was posted in Float My Oats, Savory, Wanna Be Foodie and tagged bacon, living darling, rice cooker oatmeal, savory oatmeal, steel cut oats recipe on January 9, 2016 by Sarah. My love of Oatmeal began back in 2008 when I watched Alton Browns episode on Oatmeal. I immediately started making oatmeal in the crock-pot. I loved how easy it was to wake up to those warm, cozy oats. I noticed that very few people shared my wild enthusiasm for oatmeal but after many sleepless nights contemplating this tragedy, I concluded that its boring image needed to change. The days of Ooey-gooey oatmeal drowned in milk, with predictable toppings, is over starting now. Maybe itst the wanna-be-foodie in me, but oatmeal is meant to be bathed in Olive oil, a crack of pepper, shreds of sharp cheese and perfectly steamed vegetables. Its meant to swim in luscious coconut milk, with fresh pineapple chunks, and shaved coconut. I could go on and on..and I promise I will. I have tried numerous cooking methods but a couple years ago my friend Heidi introduced me to my favorite method, the rice cooker. It is really fast and I love the texture, Its more like rice than a porridge. I usually turn the rice cooker on when I first wake up and then come back to it when I’m finished getting ready for the day. I use a 2 to 1 ratio of water and steel cut oats. 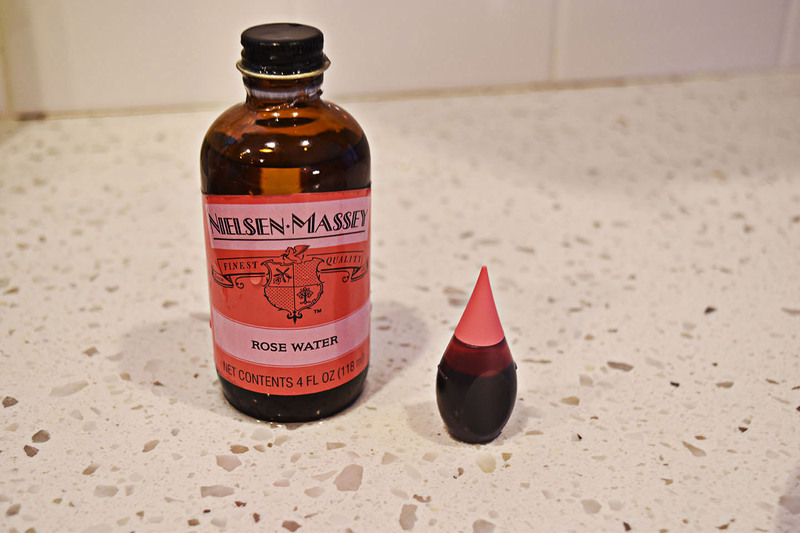 You can sub the water for just about any liquid. My favorite substitutions are chicken stock and coconut milk. 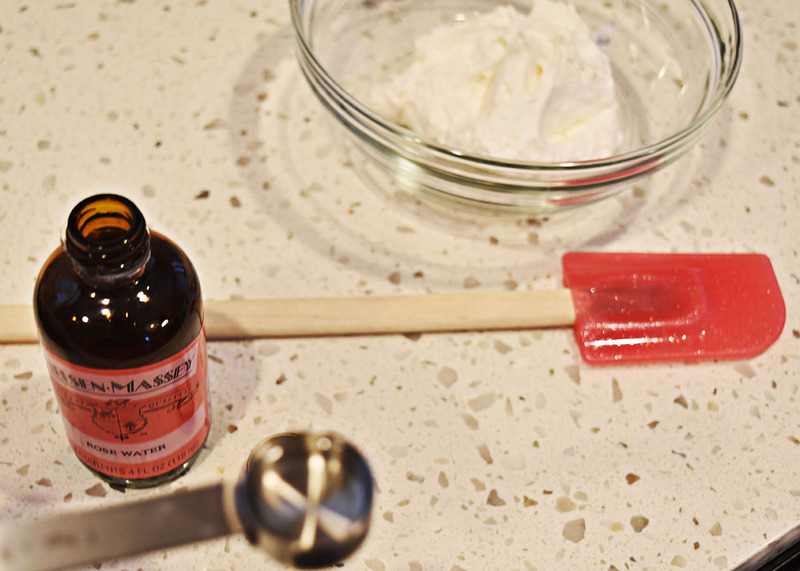 Add bouillon paste to warm water and stir until dissolved. 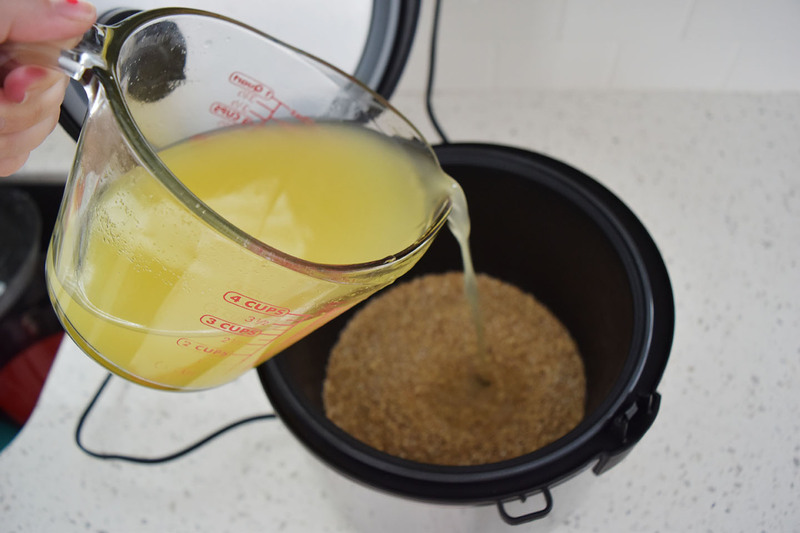 Add steel cut oats and water to rice cooker, set to “brown rice” and let it do its magic. Be sure to check your rice cooker for specific directions on cooking oatmeal. My cooker takes about 20 minutes for a small batch and 40 for a large batch. Add toppings. Add steel cut oats, water, and coconut milk to rice cooker, set to “brown rice” and let it do its magic. Be sure to check your rice cooker for specific directions on cooking oatmeal. My cooker takes about 20 minutes for a small batch and 40 for a large batch. 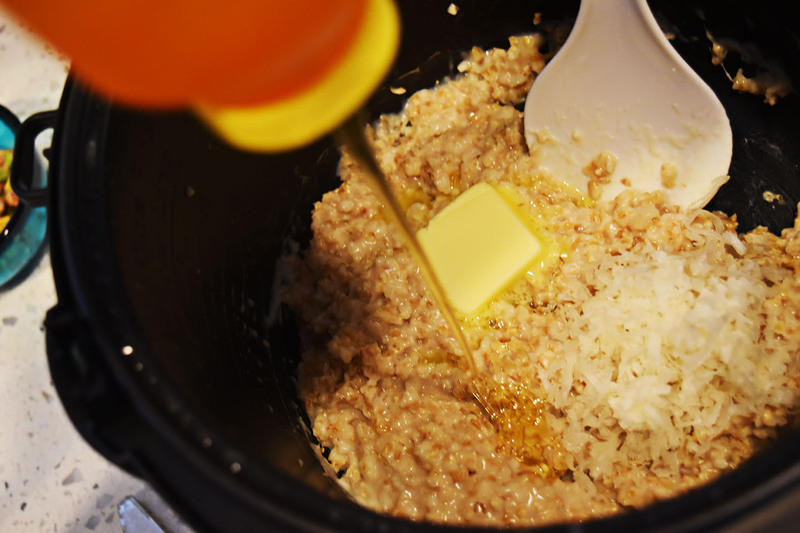 Once the rice cooker is done, stir in butter and honey until mixed well. Add toppings. The possibilities are endless when it comes to oatmeal. You may be skeptical but that is OK. I look forward to converting you. 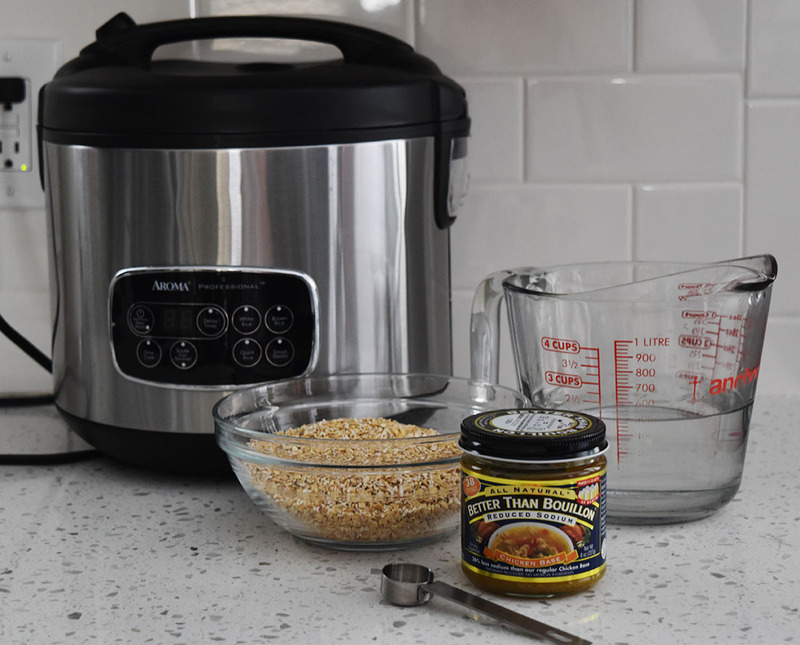 This entry was posted in Float My Oats, Savory, Sweet, Wanna Be Foodie and tagged Float My Oats, Gourmet Oatmeal, living darling, rice cooker oatmeal, Steel Cut Oats on January 7, 2016 by Sarah.